I went to the Craft and Hobby Association trade show last weekend and it was beyond amazing. You can read my full recap on the show here. For a portion of the show, I was honored to be able to work the booth for DecoArt and help people to make a fun decoupage craft. The best part? I was allowed to design the craft people would be making myself. I designed this fun embroidery hoop art for the show. If you made one of these with me, please comment below! Before we get to the craft tutorial, I must say I loved every minute of the demo. 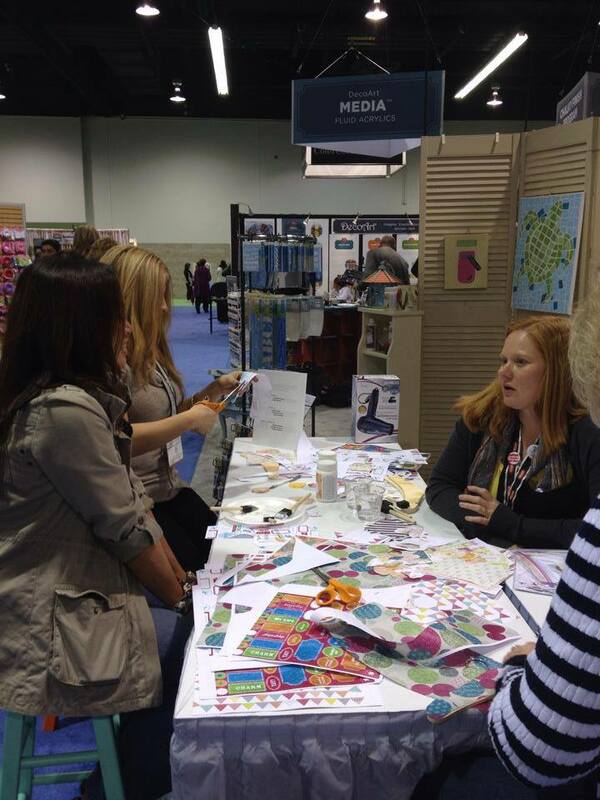 I sat and talked with people while showing them how to use the new line of Americana decoupage mediums. These will be coming to a store near your soon so keep an eye out. NOTE: The demo in the picture below is actually not the embroidery hoops it was another project. Now lets get started on the embroidery hoop art. Start with 3 inch embroidery hoops and 4 inch squares of paper in this case. 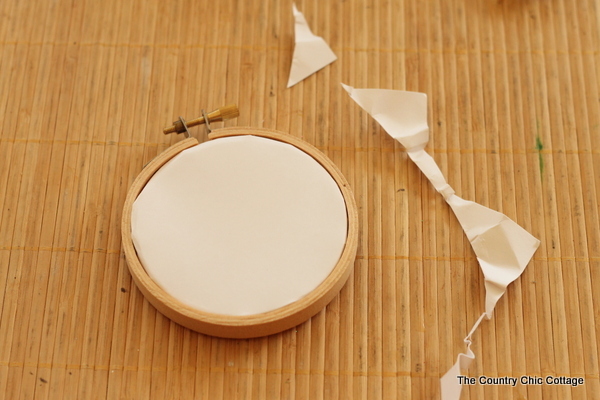 NOTE: The thinner the paper the easier it will be to put in your embroidery hoop. You can modify this to make the art any size you desire. 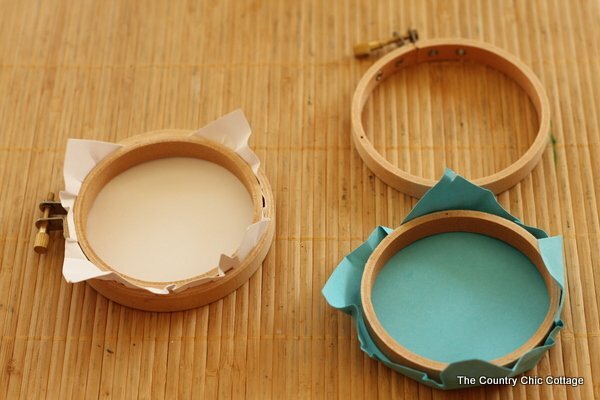 Put the paper on the table and pull up around the inner hoop as shown on the right. Make sure the screw on the outer hoop is loosened COMPLETELY. Then stuff the inner hoop into the outer hoop. Tighten the screw and you will have the image on the left. 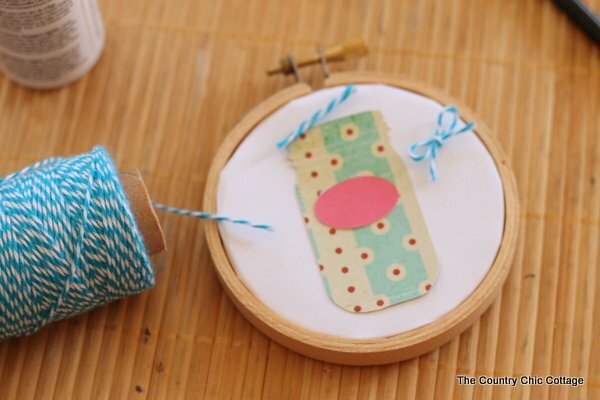 Use scissors to trim away any excess paper on the back of your hoop. 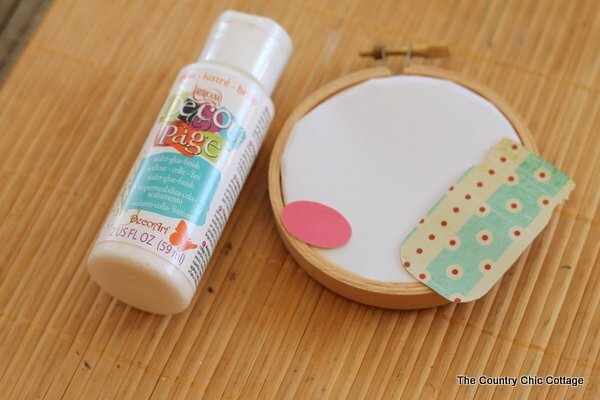 Use Americana Decoupage medium to adhere paper cutouts to the hoop. You can make a cut out of anything you desire using a cutting machine like a Silhouette or Sizzix or cutting manually with a craft knife. This example is a mason jar but I also had fawns, foxes, and deer heads for the make and take. 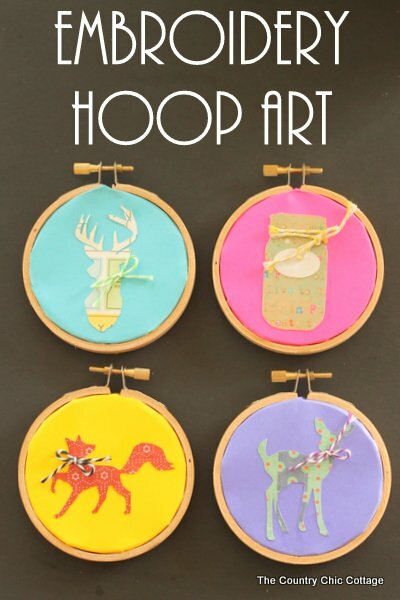 Each hoop also got a 3D element from baker’s twine. 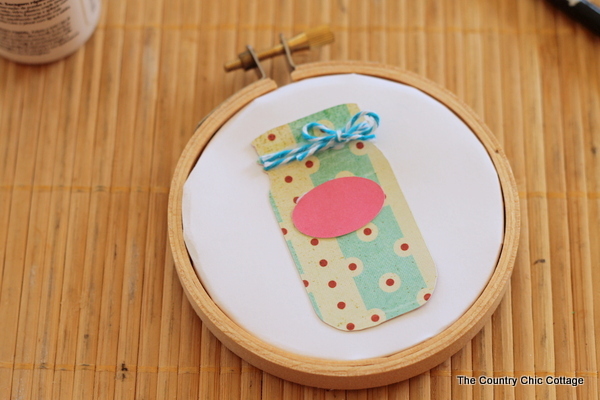 Tie a bow and add to your project with the decoupage medium. For the mason jar I also added two strands of baker’s twine for a divider between the “jar” and “lid”. Allow the decoupage medium to dry completely and your art is done. I also had quite a few at CHA who loved glitter. The Americana decoupage comes in a glitter formula and if you put a thin coat over the top of your project it will add a touch of sparkle. So I want to know….which of these do you like best? If you had been at CHA, which one would you have made? 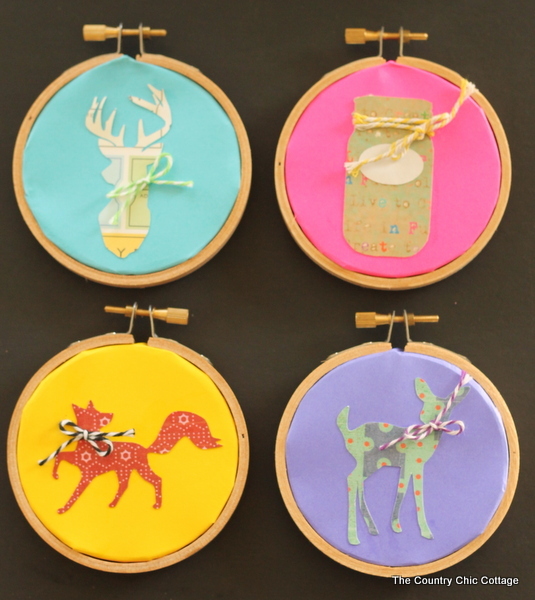 I love embroidery hoop art in all forms and doing a demo of it at CHA was a dream come true. Thank you so much for reminding me!! The thinner the paper the easier it is to insert. I ended up doing a thinner paper then is pictured for most of the make and take. 🙂 I have modified my post now.